A new federal report calls out the Snohomish County Sheriff’s Department (WA) for its “non-cooperation” with President Donald Trump’s stepped-up efforts to round up and deport those in this country illegally. 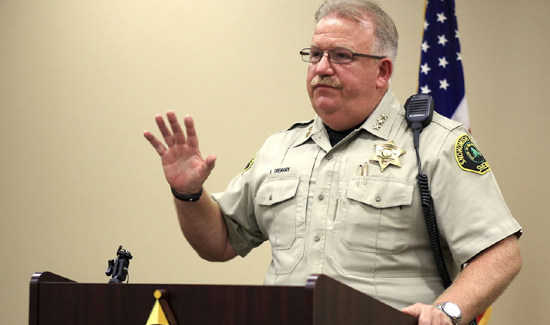 And county Sheriff Ty Trenary (above) isn’t the least bit pleased by what seems a public shaming of law enforcement agencies that refuse U.S. Immigration and Customs Enforcement requests to detain individuals behind bars indefinitely without a warrant. Monday’s report from the Department of Homeland Security is the first tally of which law enforcement agencies are ignoring its enforcement arm’s request for help. New reports are required weekly under Trump’s Jan. 25 executive order on enforcing the nation’s immigration laws. “When law enforcement agencies fail to honor immigration detainers and release serious criminal offenders, it undermines ICE’s ability to protect the public safety and carry out its mission,” said Acting ICE Director Thomas Homan in a statement accompanying release of the Declined Detainer Outcome Report. Immigration and Customs Enforcement issued 3,083 detainers in the U.S. from Jan. 28 through Feb. 3, the initial reporting period. Of those, 206 were declined, according to the analysis. Snohomish County received 12 detainer notices, fourth most in the report. Clark County, Nevada, tops the list with 51 followed by Nassau County, New York, with 38. It is unclear if the number for Snohomish County is accurate. The report lacked information allowing it to be independently verified Tuesday. Calls and emails to the Homeland Security media representatives did not get returned. Accuracy is an issue. The New York Times reported Monday that the federal agency admitted Nassau County was erroneously included.